When I met my future wife Rose-Marie in 1963, she told me she was born in the Faroe Islands. I had no idea where they were and this was before personal computers and Google, so the only way to do research was at the library. I discovered they were an archipelago of 18 rocky volcanic islands situated in the mid-north Atlantic about halfway between the Scottish Shetland Islands and Iceland and they were a self-governing country within the realm of Denmark. When Denmark fell to the Germans in 1940 the British started Operation Valentine, which was the occupation of the Faroe by the British Forces. The Islands were strategically placed safe havens for the convoys and for re-fueling. The royal engineers built the runway at Vágar for their aircraft; this is the current site for the airport on the Faroe Islands. My wife’s father, Tommy Whiteside, was stationed as a gunner at Skipanes, on the island of Eysturoy; the gunners were to intercept the Luftwaffe as they tried to bomb the fuel tanks further up the fiords. While he was there he met and started courting Anna Katrina Joensen who lived at a place called Undir Gotue, also on the island of Eysturoy. We were told many years later that he used to swim the couple of miles from his station to her home. Eventually they were married and Rose-Marie was born in November 1944. When Denmark was liberated, the British occupation terminated in May 1945 and the British forces returned home in September that year. Tommy and Anna returned to Belfast, Northern Ireland with Rose-Marie. When I met Rose-Marie she told me she had spent her 17th birthday in the Faroes in 1961. She stayed with her aunt Sofia and her family at Syðrugøta and spoke fondly of her cousin Malan who was about the same age. Travelling from Belfast to Tórshavn, the capital of the Faroe Islands was something of an ordeal in 1961, not like today. First she would travel by road to Larne, then the ferry to Stranraer in Scotland, then train to Aberdeen via Glasgow and then she would board one of her uncle’s fishing boats to the Faroes. When her aunt Sofia passed away, Rose-Marie lost touch with the family. However, through the miracle that is Facebook, we were able to reestablish a connection in 2009. When we decided to travel back to Belfast in 2010, Rose-Marie and I tried to make a side trip through the travel agent but he could not do it. Through the internet we found that there would be flights from Stansted, London to Vágar, Faroe Islands starting in July 2010 so we booked, little knowing that we were on the first flight of Atlantic Airways between these destinations. Rose-Marie’s cousin Malan was married and now living in Tórshavn and they were adamant we stayed with them. Our first impression of the Faroe Islands was that there were no trees, the only trees were imported and planted by the residents in their own gardens. Yet, the spectacular landscapes on the drive were magnificent, large deep fiords, small fishing villages and plenty of fish farms in the waters. Tórshavn, situated on the southern end of the island of Streymoy, is one of the smallest capital cities in the world, but with a large port that accommodates large cruise ships. You can also travel by ferry from Copenhagen, Denmark. The temperature during our visit is sub-polar, quite pleasant; the seas never freeze over because they are affected by the gulf-stream all year round. Malan and her husband Sverri had a lovely wooden house overlooking the international football stadium of Gundadalur and we were made most comfortable. Malan and Sverri have three daughters, Suzanna, Jorun and Birita and all their children came to meet us and welcome us to their homeland. It was a pleasant walk through a lovely park that took us to the town centre and port area. The old fortress of Skansin has relics of the British occupation with the old guns left behind. 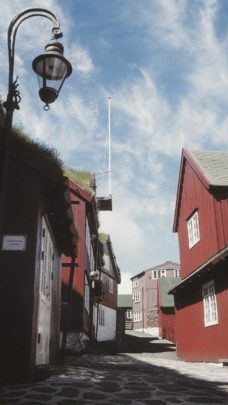 The old part of the town is the little peninsula of Tinganes, the unique character of the historic centre with the attractive multi-coloured grass roofed buildings is a must attraction for visitors. We were taken for a drive to Kirkjubøur, which is about 20 minutes away and a most significant historical site. It was once the cultural capital and historical epicentre for the islands. You will find three of the most historical sites in the Fareo Islands located here — the ruins of St Magnus Cathedral can still be seen, the present day church of St Olav is a relic from the Viking era and it was a stunning piece of Nordic history, and the old farmhouse Kirkjubøargarður. We were then taken to the island of Esturoy — all the islands are connected by road tunnels, ferries, causeways and bridges — to the house where Rose-Marie was born. Her cousin, Regin, had built a few more buildings on the site and his family were all living there, but this day the whole family came from far and near to meet again with Rose-Marie and her family. It was quite a gathering. The spread was fit for a Queen (or the return of one of their own) and had all kinds of fish, shellfish, caviar and whale meat, which was surprisingly very tasty. 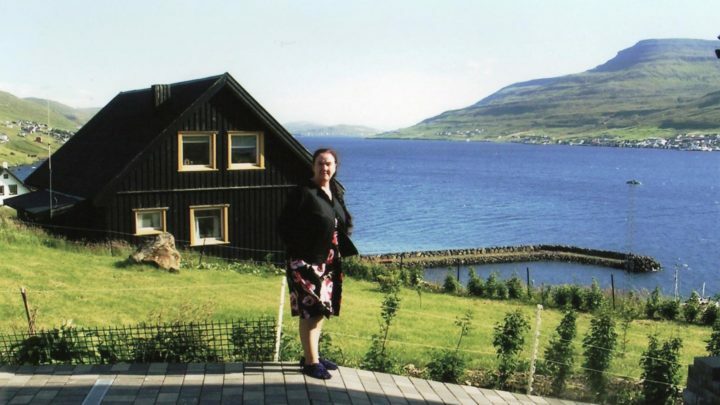 The house itself was on the high side of the road with breathtaking views of the fiord. We also visited the home of Malan’s brother Jegvan who lived in the house in Syðrugøta where Rose-Marie stayed in 1961, this was another beautiful little village situated on the fiord. Further trips we made were to Kunoy a small settlement where the grandparents lived, beneath an incredible vista of craggy layer-cake volcanic cliffs. Also in the area was the view of the sea and rock formation known as Risin og Kellingin, which translates to The Giant and the Witch (hag). The Giant is the 71-metre stack further from the coast, while the witch is 68m and standing nearer the land. Legend has it that the giants in Iceland were envious and decided they wanted the Faroes, so the giant and the witch were sent down to the islands to bring them back. When they reached the mountain at the north-west end the witch attached a rope to it and pulled, the mountain split. They struggled on, but still the mountain could not be moved. If the sun shines on a giant or a witch, they turn to stone, and both failed to notice time passing as they pulled at the mountain. When dawn broke, they were turned to stone on the spot. Árnfjarðarvík is an arresting landscape of fiords and waterfalls. We took a boat trip from Vestmanna on the Atlantic side of the islands. The boat hugged the shoreline and went in and out of cave formations. High on the near vertical cliffs you could see the hairy sheep clambering along, how they did not fall down these cliffs I don’t know. There was also a large collection of nesting gulls and puffins. A significant day in Tórshavn is St Olav’s day on July 29. Festivities continue into the weekend. They celebrate the Norwegian saint because he was the one who brought Christianity to the islands. There is a procession of all the sporting clubs from the nation and the members of parliament follow and open proceedings of the local government. Each town/village has their own rowing team of six, eight or 10 rowers and they have the races in Tórshavn Harbour. 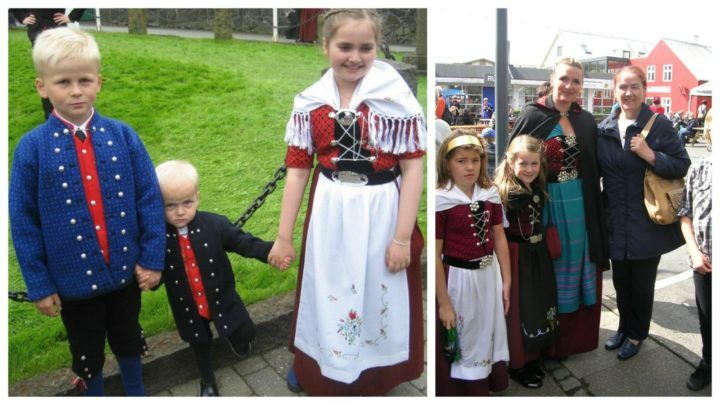 The weekend is a festival of folk music and at night communal singing and chain-dancing, and most locals wear the traditional Faroese costumes. The Faroe Islands has been described by National Geographic as one of the most natural beauty spots in the world and I couldn’t agree more, it is so special that a few years ago we brought our two Australian granddaughters for a holiday and they both were enthralled with the spectacular landscapes and the friendliness of the people. Have you been encouraged to travel and see where your family history takes you?